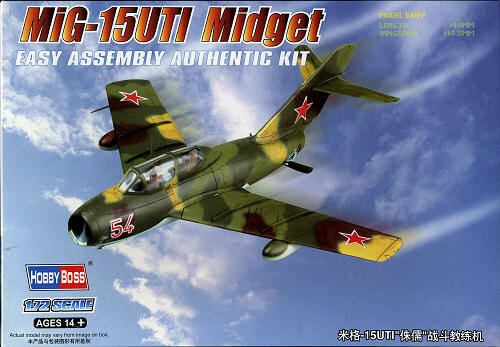 Wwe all are aware that the MiG-15 was the Soviet Union's first widely used jet fighter. Earlier jets were based on German designs and powered by German design engines. These were, for the most part, straight wing planes that provided the needed turbojet training, but were not capable enough to be seriously considered for mass production. The MiG-15 combined Soviet engineering with a British turbojet to produce a world-class fighter that was a considerable surprise to the West when met in combat over Korea. However, it was quite a leap from piston power to turbojets for most pilots and the MiG was considered a relatively stable aircraft to fly. A trainer was needed and what better airframe to provide that than a proven design. Hence, the two seat MiG-15 UTI. As with its contemporary T-33 (also based on a then-current fighter, the F-80), the MiG-15 UTI well outlasted its originator in unit service, some being used as Air Force trainers with some of the smaller nations up until the turn of the century, a remarkable life span that was equaled by the T-33 as well. Because of their simplicity and ease of maintenance, many MiG-15 UTIs are still flying in the loving hands of various warbird ownders. First thing I noticed on this kit is the rather large MMD/Squadron sticker placed on it. Apparently MMD has added another company to its web of imported items so that should improve availability and also prevent smaller shops from importing direct. Nothing really new in terms of the presentation of this kit aside from the fact that, unlike their small WWII kits, this one only has the major airframe bits in the plastic insert. 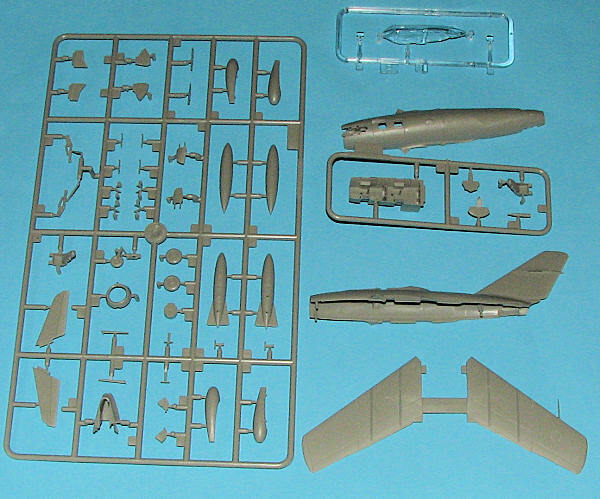 Under it is a sprue that is common with the standard MiG-15 kit and includes wheels, landing gear, fuel tanks, gear doors and a number of other pieces. In fact, It would be fair to say that this kit has probably as many parts to it as a standard 1/72 kit of this aircraft. Where the Hobby Boss kit differs is that the fuselage is split horizontally instead of vertically. This provides the benefit of having the fin in one piece. The upper and lower fuselage halves are designed to fit with one half having an overlapping section that fits along side an indented section in the other half. This runs the length of the fuselage. Makes for a pretty clean fit, though it also puts a seam through the inside of the speed brake well. Alignment pins are large, but are not the 'snap fit' ones of older kits. Interior is one piece with the control sticks and consoles molded into the tub. Control sticks are just that and have no bearing on the look of the real thing. I surmise that the consoles are equally as vague. Two instrument panels are provided, both totally devoid of features and there is no instrument decal to use in their place. Hobby Boss really needs to address this and provide at least a decal for these very visible panels. The one-piece wing is trapped between fuselage halves, making seam clean-up more difficult for the area behind the wing. The wheel wells have surprising depth and detail, in fact, the whole kit's detailing is quite good, though perhaps a bit overstated for some. The speed brakes can be posed open and one is provided with a proper cannon and radar altimeter antennas. There are also optional fuel tanks for under the wings. The mounting holes are drilled for either. This aircraft wa s most often seen with the larger, non-conformal tanks. There is a separate nose and a nicely done splitter intake. You will need weight and though no information is provided, there is room inside the splitter. A single piece canopy tops the whole thing. Instructions are well done with one side of the sheet in full color and it includes the painting and decal guide. Several paint brands are provided in the reference, but the only one with all the colors shown is Gunze. 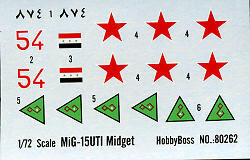 The two options are for a Soviet or Iraqi camouflaged plane. The decals are well printed and very gloss. The Iraqi green looks to be too bright to my eyes. Fortunately, there are a number of aftermarket sheets that include UTI markings though you may have to do some searching to find them. To my eyes, this is the first semi-'serious' kit that I have seen in the el cheapo range from Hobby Boss. Sure, it has some shortcuts and some omissions, but the kit is well done and looks the part. Now that even small Hasegawa 1/72 kits are in the $20 range, these will have to take their place in the 'impulse buy' or 'pocket money' range for now. Thanks to me and impulse buying for this one.